A large branch from an oak tree near Wake Forest Elementary School fell on a car and power lines Friday morning. WAKE FOREST (WTVD) -- A large branch from an oak tree near Wake Forest Elementary School fell on a car and power lines Friday morning. Part of the tree crushed a red 2007 Ford Focus and knocked out power to the downtown area along Sycamore Avenue near South Main Street around 9 a.m. The owner of the car told ABC11 that he was in his house and he heard electrical arcing, then electrical explosions, and a huge crash. He said he went outside and found several down power lines and his wife's car crushed under the weight of the huge tree branch. It is unclear what caused it to fall. 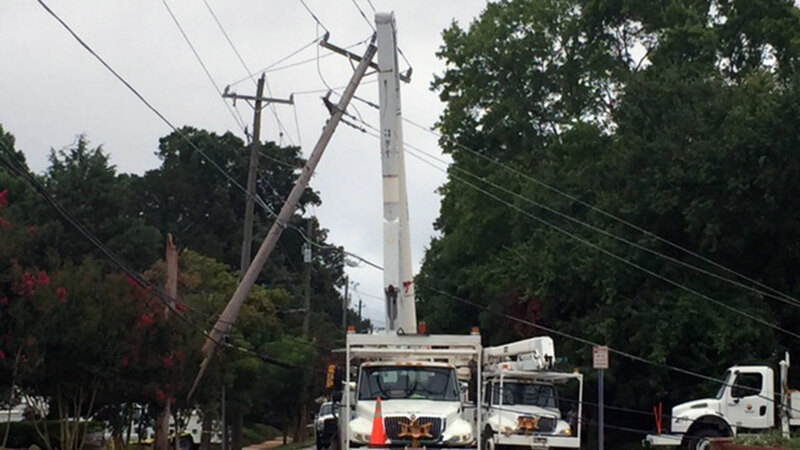 The utility company, Wake Forest Power, said Time Warner and Century Link cable lines were also damaged. Crews are working to repair the damage, but it is unknown how long it will take to restore power. South Main Street is currently closed from Holding Avenue to Elm Avenue.